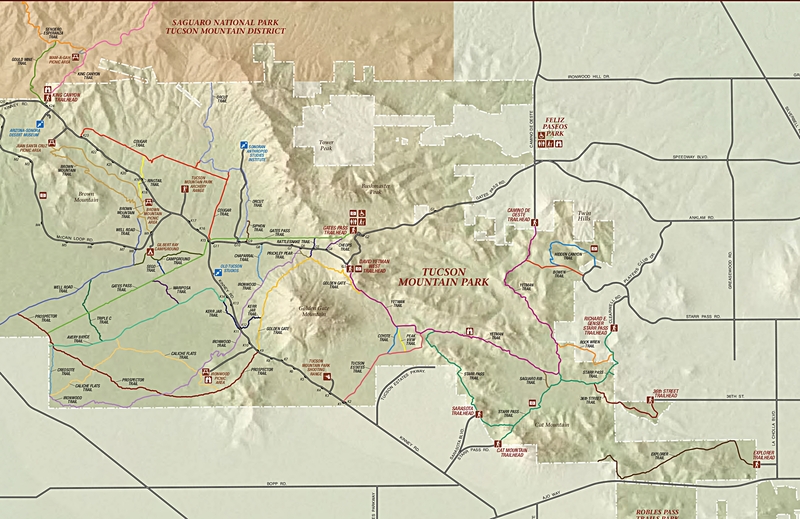 The Tucson Mountain has many abandon mines but only four were considered profitable; The Mile Wide Mine, Gould Mine, Gila Monster Mine and the Yuma Mine. The Yuma Mine was the most profitable. This mine is located just south of Picture Rocks Peak and dates back to 1872 and continued on sporadically under different owners until the 1980’s. This mine produced Lead in the early years, Molybdenum during WWI and gold in the later years. There was a mill and smelter on the site in the 1920’s. 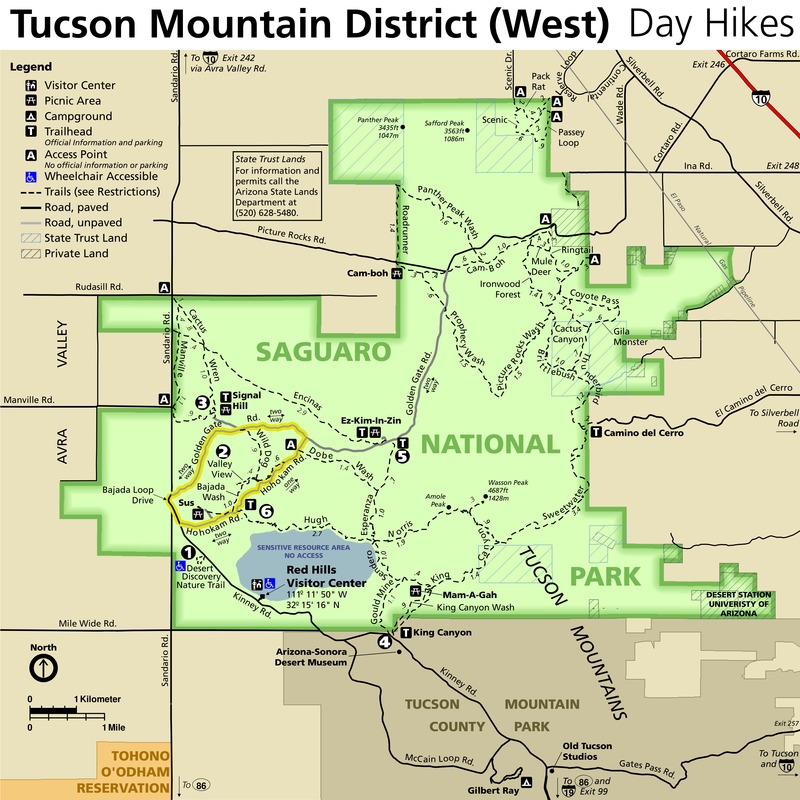 In 1932 on a mine related topic about someone trying to make it rich, Cliff Adkins kidnapped Tucson Banker Gordon Sawyer and demanded 60,000 dollars ransom. Sawyer was found alive but Adkins escaped. After posting a $5000.00 reward, Adkins was found hiding out at the Yuma Mine and arrested. Gold was mined there in the later years using cyanide to leach out gold but due to environmental issues this was halted by the 1980’s. 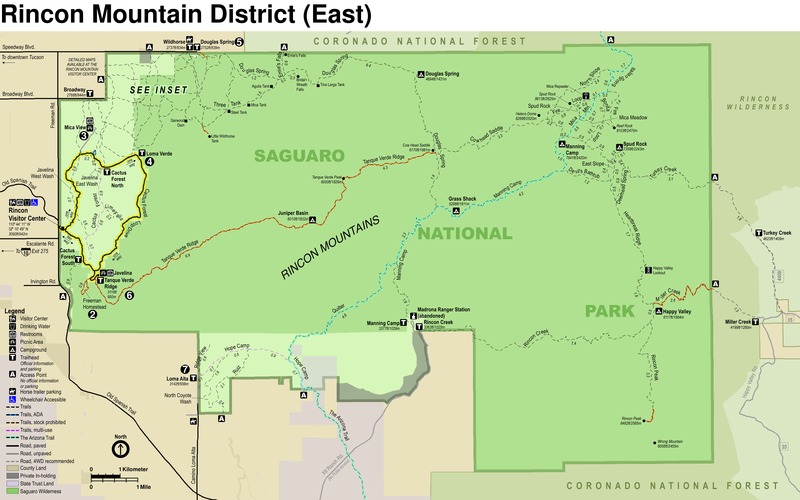 The government acquired the land in 2001 and turned it over to the park. The mine today is still there with its open shafts, but the mill and smelter along with the wood buildings are gone. 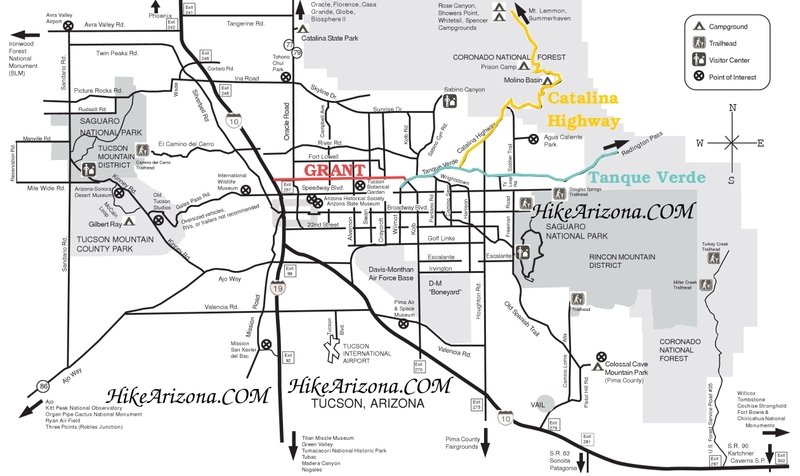 There is a lot more information on the internet about this mine and is probably a good Idea to do a little research before heading to Yuma Mine. 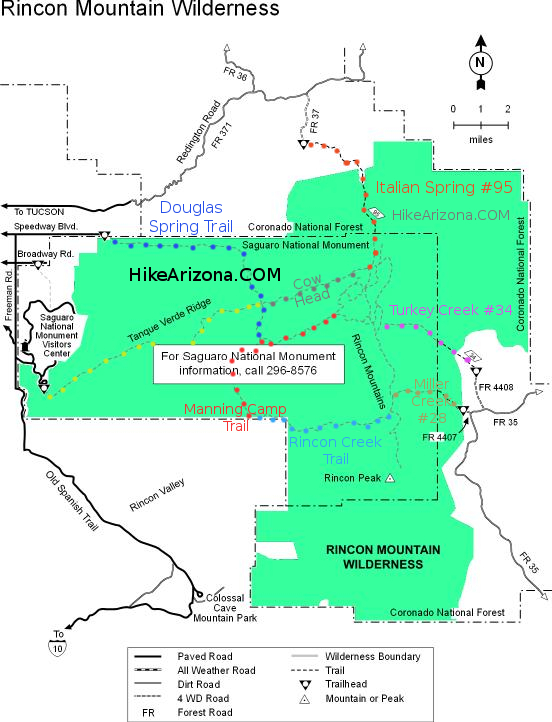 This route to the Yuma Mine is not an official park trail but connects up the Vertical Cliffs Trail to the Picture Rocks Wash Trail. 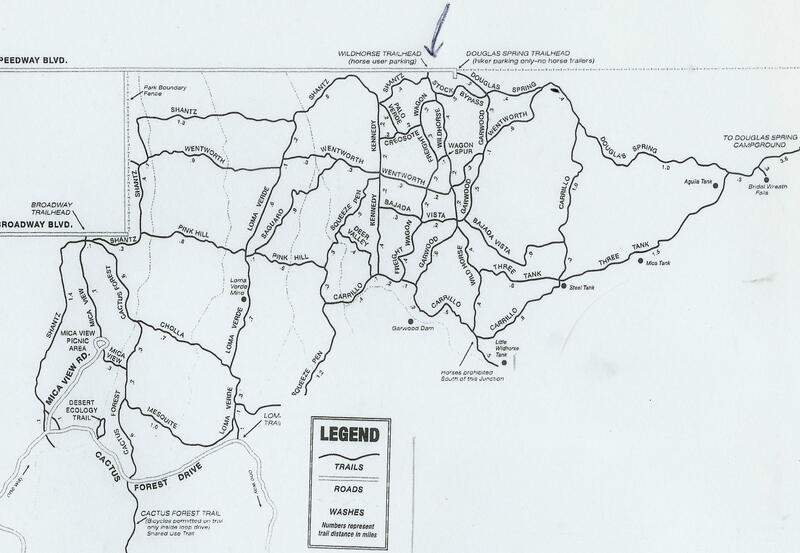 Just to the south of the mine is private property so the route stays just to the north of it. From the junction at the Vertical Cliffs Trail 1.5 miles in and where it changes to a southerly direction the Yuma Mine route heads to the north and drops into a wash. Just after crossing the wash is a fence Marked private property. Head west along this fence and after 100 yards or so there is an old trail that heads up a hill to the south, this trail will go up to the crest of an east-west running ridge. I lose the trail there but found it best to head west on the south side of that ridge eventually dropping into the small wash. Continue up stream and exit the wash heading up to a saddle where there are some excavations. This saddle is to the east of the main mine but has about a half dozen shafts located in this area. The mine is following along a vein that was dipping down diagonally along this ridge so the mining operations were all along this portion of the ridge. Head west on the south side of this ridge to the main mine shaft. Take your time there is a lot to take in. I think I spent the better part of an hour exploring the area. Continue on down an old road to the west of the mine to a location where the Mining buildings were located. Lots of old Trash from the mining operations still laying about the desert floor. To continue on to the Picture Rocks Wash Trail follow this old road north, to the east of the road will be private property. This old road will connect up with an east-west running road that leads to Picture Rocks Wash right at the junction with the Ringtail and Picture Rocks Wash Trail. If coming from the north along the Ringtail Trail this route to the mine is right at that intersection of the Ringtail and Picture Rocks Wash. Just head out of the wash at this point through the brush and you will be on the old road. This description was my route but not the only way, from the wash crossing near the Vertical cliffs Trail you head west and you will come to the mine. Your only limits are the private property to the north. Remember if visiting the mine, Leave things as they were and don’t do anything stupid that will result in injury or death. It is always a pleasure to be able to visit old mining sites and their history but it only takes a few careless people to ruin this experience. Although I didn’t see any these old mine shafts are favorite locations for bee and snakes so use caution. Interstate 10 in Tucson take the Ina Road exit west. South on Silverbell Road to West Belmont Road. !.3 miles west on West Belmont Road to the El Paso Pipeline Road. Trail Head parking on south side of road.